Singer Achinoam Nini, known outside Israel as Noa, has turned down a prize, apparently due to the fact that a religious, politically right-wing singer-songwriter will be getting one too. Nini was to have received a prize for her contribution to sharing Israeli music overseas, from Akum, the national union of composers and musicians. She had also planned to take part in the awards ceremony. Nini’s “ideological reasons” appear to be linked to the news that singer Ariel Zilber will also be awarded an Akum prize. Zilber will get an award for lifetime achievement. 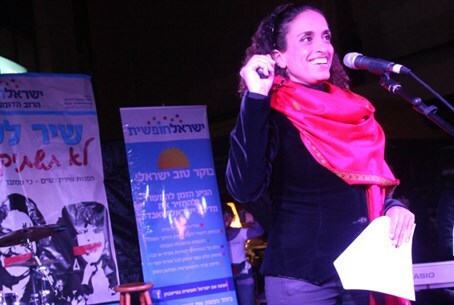 Zilber was raised in a secular Jewish household but later became orthodox, and is known to hold politically right-wing views, which may have upset Nini, whose views put her on the extreme left of Israeli politics. Nini is open regarding her far-left views. Earlier this week she termed Israel “a fascist state” over the questioning by school officials of a teacher accused of trying to convince students not to join the IDF. Producers of the Akum prize awards ceremony expressed upset at Nini’s decision to cancel. “Someone who spreads the message of peace every day should know how to respect others in her own country, too,” one told Yisrael Hayom. Nini’s behavior is “outrageous,” he added.